GASTRONOMY by Joy: What does a Wilton Cake Decorating Class Worth? How much does your favorite cake costs? Let me prove my point on this, just like what Julia Child said "A party without a cake is just a meeting." A cake isn't only a symbol of adding years to ones life but an element of celebrating a person's being. I'm not being implicit about saying that a person's value is gauged on the kind of cake you give, but it somehow matters. In our house, no birthdays were celebrated without a cake and I make sure I give a beautifully crafted cake to my dearests, after all their birthday happens only once a year. I wouldn't want to have a regular cake neither, on my birthday, as if no effort were put for me. If you have a cake, of course, you want to eat it too, but before you put a knife into it, you would want to either read the message or adore whatever is embellished on it. But for a baker or a cake artist it's a whole different meaning. “Cake makes people happy. It's very versatile and can be a canvas for so many ingredients,” said Rebecca Merhejat an interview with The Guardian, chef de cuisine and pastry chef of Love & Salt in Manhattan Beach, Calif. “You can play with interesting flours, or nuts, or different varieties of fruits with each season. It makes me want to bake a cake just thinking about all the options. “Cake is one of the desserts that bring me the most joy because it brings my customers and clients the most joy.” Rachel Flatley, pastry chef of Townline BBQ and Rowdy Hall in East Hampton, N.Y. Even for the poet and writer C. JoyBell C.
I'm sure Chef Peachy Juban would agree to her. So, I've met this wonderful cake artist/baker/teacher, Chef Peachy! We may share the same love and respect for the art of baking and cake decorating, but her passion preceded beyond my understanding of what a beautiful cake is. Last weekend (March 11 and 12) were spent with her at Gourdo’s World Market-Alabang Town Center with other cake decorating enthusiasts as we all gawked on her steady hands while she makes florets and flower petals. Chef Peachy have invested more than half her lifetime to this passion. She had 20 years of fool-proofed service to her clients, some good years with Pastry Alliance Philippines and a couple with the School of Hotel, Restaurant & Institution Management in De La Salle-College of St. Benilde, as a chef instructor. She also runs her pastry business in BF Paranaque, Shortcrust Pastry, were she whips up all the magic for every brides' and debutants' dream cake. 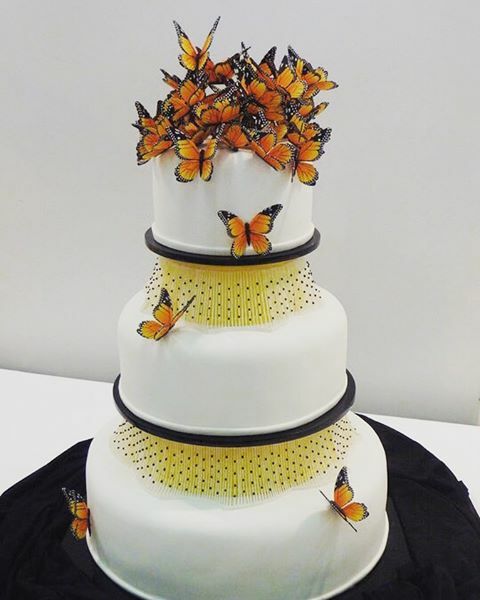 You will definitely stop wondering when you see her cake creations with her signature design- magnificent lantern cakes, notwithstanding my favorite of her creations, the 2010 gold awardee for Food and Hotel Asia Singapore Wedding Cake competition, A-Flutter. To recount, I've only been to Gourdo's, Alabang five times perhaps since most of the time I visit their branch at The Fort. I didn't realize there was a facility for workshops there until last week. The room sealed with a glass door from the store, inside has a long table for the students and one for the instructor. The walls, ahh, I love the walls, adorned with food quotes and foodie terms. It even had a sink and enough counter-top space for easy clean-ups. Shoppers during the sessions peeked through the room, kids love coming inside too, to inspect further, eyeing on what we were doing and perhaps were encouraged to enlist on the nest classes. The Wilton Cake Decorating Courses 1 and 2, which I took are hands-on courses which spanned for eight hours and I all-heartedly yielded to in two days. Wilton Course 1 (P8,500) is all about buttercream -- icing and decorating a cake and other sweet treats. 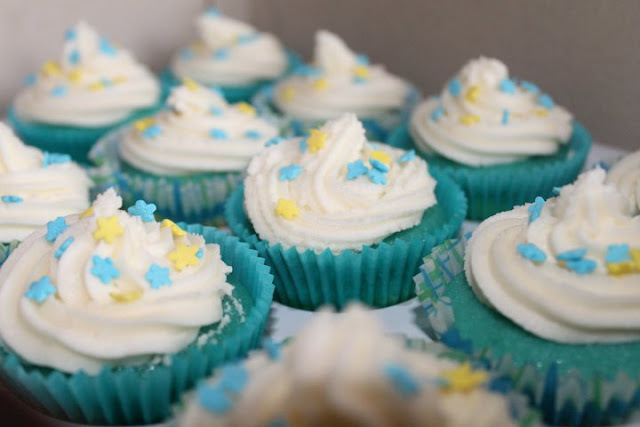 Everything you need to know about buttercream and how to use it is at the booklet provided, including the recipe which I found to be the best consistency for decorating. You will also know how to cover the cake properly to prep it for whatever decorations you intend to. The teacher always says baking is a science too, same goes with the decorating, so proper handling of the piping bags and setting the precise angle of the tips gives you the design you're aiming for which again is included in the kit. 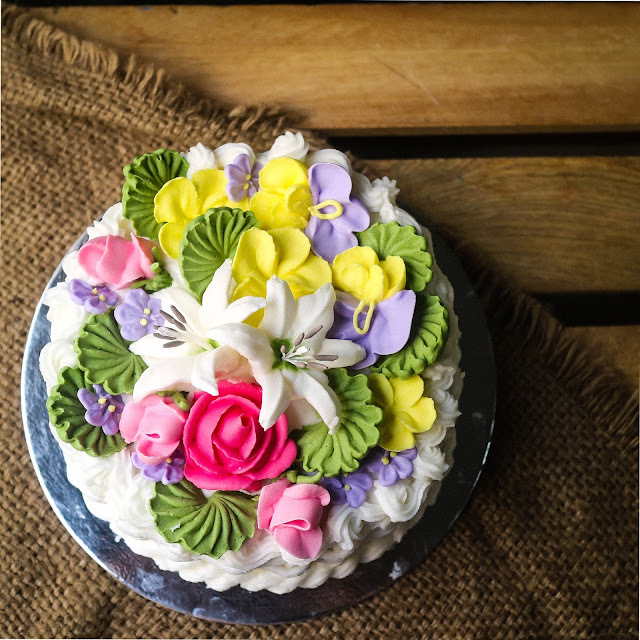 Designs come in simple to ornate borders, to shapes even a character figure and on your cake; making six different buttercream icing flowers, and transferring the images to a cake to decorate. Wilton Course 2 (P9,000) gives you the opportunity to work with royal icing, the ideal medium to use when creating flowers and decorations in advance. It teaches core techniques in making a wide variety of flowers such as pansies, lilies, and The Wilton Rose. You’ll also learn how to design a professional-looking cake, from selecting the colors to arranging your flowers. This was one of the most fun cooking and baking class I had. See the photo? Really, never a dull moment with Chef Peachy. I don't know how she manages to keep her wits intact, hands steady and still make all the "kwento" of her life. A photo of a cupcake being decorated by the chef with sunflower design. Making two different designs from one frosting tip, the twirl (with swirled colors) and the rose. My floral cupcakes. You will be amazed that three of these cupcakes were made using only one kind of tip. Our table, though always messy, but since it's stainless, clean up is no fuss. My seatmate's cake adorned with Wilton Roses on top, beaded and bordered elegantly. After finishing every course, you will receive a certificate,of The Wilton Method of Cake Decorating signed by a Wilton-certified instructor and Gourdo's store representative. The whole class for two days, together with Chef Peachy and her staff. The flowers and leaves were made of royal icing that hardened overnight, which we made in the afternoon of course 1. These were used to decorate our own cake bouquet in a basket. With buttercream icing, and a few easy-to-follow techniques, You will be able to do a basketry design to your simple cake. These are practiced samples of Wilton rose created with the help of lily nails. The white flowers were also made with royal icing but using a flower former. One of my classmate decorating her cake. The fees are inclusive of the basic tools to get you started. The Wilton student kit for course 1 had 12 pieces of assorted basic piping tips and bags, a Wilton booklet, boards that served as technique guides, an offset metal spatula, and a flower nail. All the items in the kit and other Wilton products are available at all Gourdo’s branches. The next Wilton Workshop at Gourdo’s Alabang Town Center is scheduled for May 6 and 7. To be offered are Courses 1 and 3. Wilton Course 3 (P10,500) revolves around gum paste and fondant. Your Certified Wilton Method Instructor will help you each step of the way as you learn to prepare and color gum paste and fondant, cover a cake with fondant, create different types of bows and flowers, paint on fondant and design and complete a cake with the shapes and flowers from the course. Similar to other Wilton courses, you get to bring home everything you made! So, what does a Wilton course worth to me? It meant re-living the dream I had of becoming a certified cake decorator. Though it's not something one can brag about like having a college diploma but it is a simple reminder that we can accomplish things in life, even without spending too much, for a hobby or for a life-long dream of a home-baking business. I bake! I mean I could whip up a storm in my kitchen but I couldn't be able to say that my cakes or cupcakes has it when it comes to decorations, it was all a hit and miss thing and no perfection at all, way back when I was trying so hard to push it into a business. Above is a photo of one of the cupcakes ordered from us way back when I wasn't busy with blogging. Chef Peachy pushed us to make every toppings to be seamless and consistent, "hindi pwede ang pwede na." Unlike my cupcakes above which fall short of Chef Peachy's standard, you also get to in vibe her professionalism and expertise in the craft. She wouldn't be in the business for more than 20 years if it wasn't for that principle. The Wilton classes at Gourdo's provides you with not only the skill but the the right tools to get you started! It was perfection, and probably most of the famous bakers I know succumbed to the Wilton addiction. It was also the brand I relied on for years when it comes to DIY-ing my cakes in a snap, You wouldn't need any other brands for your cake decorating needs, pigments were outrageously menay, all the spectrum and hints of any color you may think of, cause yes they have it all, and you can buy them at any Gourdo's store. If you're still hesitating to enroll on the next classes, for some reasons, think hands-on and personal approach, because that's what Chef Peachy and other instructors of Wilton courses are good at. Again you can buy the kit and everything too is provided for, but what you will be missing is learning from the expert - you first watch and then you do it yourself. They serve as the bridge between the notes from Wilton and you as the learner, unlike trying so hard to understand what's on the manual and spoiling your cakes and frostings as you practice. Ingredients were not skimped, you have one cake per class, and three cupcakes. Fort these courses, I went home with three cakes. Also, thanks to the ever reliable and accommodating assistants of Chef Peachy for the extra hands on those two days. The next Wilton Worskhop at Gourdo’s Alabang Town Center is scheduled for May 6 and 7. To be offered are Courses 1 and 3. Wilton Course 3 (P10,500) revolves around gum paste and fondant. Your Certified Wilton Method Instructor will help you each step of the way as you learn to prepare and color gum paste and fondant, cover a cake with fondant, create different types of bows and flowers, paint on fondant and design and complete a cake with the shapes and flowers from the course. Similar to other Wilton courses, you get to bring home everything you made! Other upcoming courses at Gourdo’s Alabang Town Center are “Camera Eats First” , a food-styling and photography workshop on March 25. They will also be conducting an Artisan Coffee Brewing Workshop on April 8 where participants can learn different coffee brewing techniques that can be done at home without the expensive machines. Lined up are lessons on making French macarons, edible paper flowers, and art maki sushi. And because Gourdo’s is not only about food and dining, a calligraphy workshop is also in the pipeline.